Are you looking for a new home? If the answer is yes but you haven’t yet decided on the destination, we have the perfect place for you to start your new life: the Costa Blanca. You might have heard of it as a popular beach destination in Spain, but the Costa Blanca is so much more than this – it is synonymous with quality of life! Among the many reasons to live here, the main benefit offered by this area is the warm Mediterranean climate with an average annual temperature of 17˚C and over 300 days of sun per year, making it an idyllic location for those who love life outdoors. Choose to live on the Costa Blanca… and wave goodbye to cold, rainy days! Living by the sea also offers great benefits for our health. The hours of sunlight, along with the good weather, have direct positive effects on our bodies. Just two of these include providing a greater level of natural vitamin D, or the iodine from the sea breeze which may lessen our chances of suffering an eye or respiratory infection. In addition, thanks to being on sea level where atmospheric pressure is higher, you will breathe a greater quantity of oxygen which helps to regulate blood pressure. If you want to start your new life by the sea, find your home on the Costa Blanca from among our huge variety of luxury apartments and villas by the sea and enjoy this piece of paradise 365 days a year. If you are looking for a luxury apartment, Blue Infinity is for you! Discover this development of 2- and 3-bedroom apartments situated in Cumbre del Sol Residential Resort, in the heart of the Costa Blanca, where you will enjoy incredible views of the Mediterranean Sea as well as communal areas which offer everything you need to relax by the sea: a wellness area, indoor and outdoor pools, and spacious terraces. 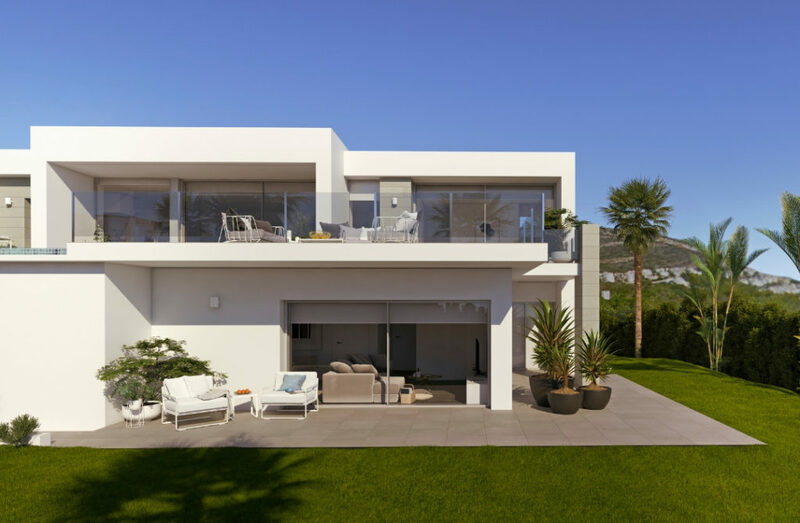 If you want a stand-alone property, discover our developments of luxury villas in Cumbre del Sol Residential Resort and get the most out of the Mediterranean. All of them are specially designed to take full advantage of the area’s warm climate from every part of the home. 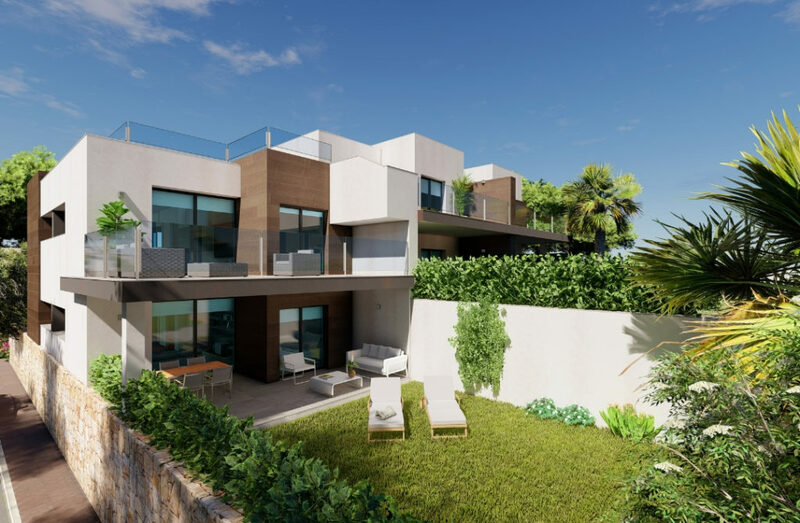 For example, in the Lirios Sunrise development you will find some fantastic views of the sea and will be able to enjoy the stunning sunrises from your own terrace with infinity pool. In addition, in this development you will have an extra space which can become whatever you want it to be. Why not create a guest suite, a gym, a games room, or an office? It will be your dream come true! In Villa Siros XL, in the Lirios Design development, you will be able to enjoy all the benefits of the sun and the sea breeze. The sea and the natural light play a key role in this property which stands out as a result of its modern design with large picture windows which fuse the interior and exterior of the home, enabling you to enjoy the wonderful scenery at any time of year. Furthermore, this villa has its own garden and a private infinity pool which appears to merge directly into the blue hues of the sea. The Costa Blanca’s good climate also has indirect benefits on health. For example, the good weather encourages participation in sports activity outdoors, which can result in improved joint function. And, if you choose to live in a luxury apartment or villa in Cumbre del Sol Residential Resort, you will be in impressive natural surroundings with an infinite number of possibilities open to you; this exclusive residential area is located by the sea and surrounded by beautiful natural parks where you can take part in all types of activities and sports such as hiking, cycling, surfing, etc. There is also a range of leisure options and services including some impressive sports facilities. Another aspect which makes the Costa Blanca the perfect place for quality of life is its rich and varied gastronomy, linked to the Mediterranean diet. If you love fine dining, you’re also in luck! This area is home to several Michelin-starred restaurants such as Quique Dacosta, which is located less than an hour from Cumbre del Sol Residential Resort. If we have convinced you to begin your new life on the Costa Blanca, don’t wait any longer! Choose one of our luxury homes with sea views. Taking the first step towards your new life is as simple as filling in our contact form. We’ll be delighted to help you! Do you dream of waking up each day by the sea, in a luxury property situated in a unique natural environment? At VAPF, we have what you’re looking for. 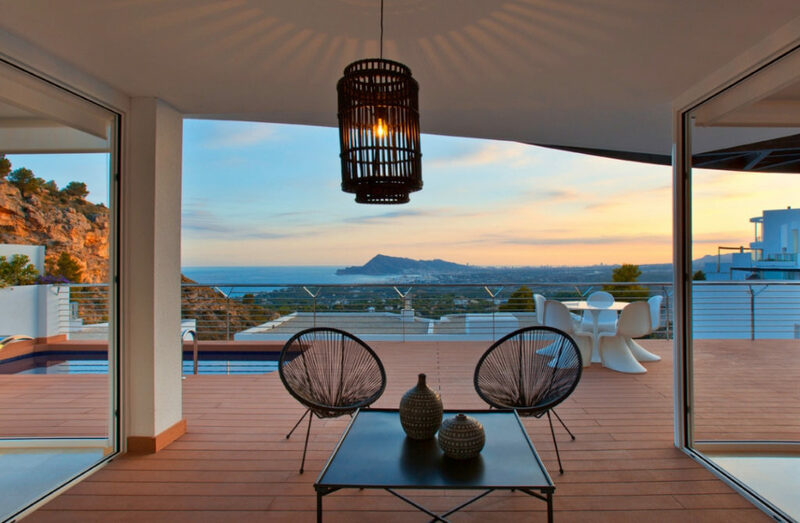 Sit back, read carefully, and fall in love with your new home on the Costa Blanca. If you’re looking for a luxury apartment where you can live a comfortable life with views of the sea, the Blue Infinity development in Cumbre del Sol Residential Resort is waiting for you – pack your bags! These modern apartments enable you to make the most of your new life in the Mediterranean, since they are specially designed to take advantage of the year-round warm climate. Choose the layout of your apartment – two or three bedrooms and two bathrooms – and enjoy all the advantages of having your own terrace of over 47m2, as well as exclusive communal areas which include a wellness zone with heated pool, jacuzzi, sauna, turkish bath, outdoor pool, gym, and garden areas. You will have everything you need to find that peace you’re looking for! 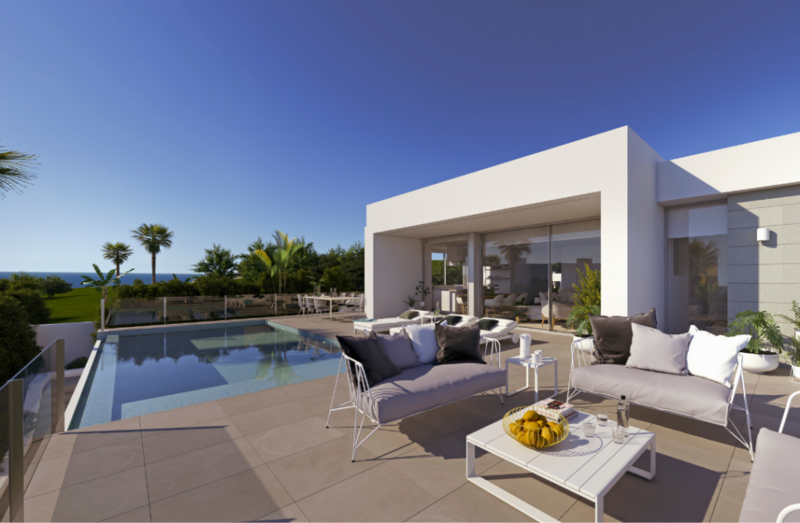 Choose Blue Infinity and fall in love with your new home on the Costa Blanca every day. If what you are looking for is the privacy which comes from living in a villa, we have a huge variety of available properties which will fit your tastes and needs. At Cumbre del Sol Residential Resort, a unique location which combines the best of the sea and the mountains, you will find our greatest variety of luxury villas. In this beautiful part of the Costa Blanca, we have our Lirios Design promotion, where our Siros XL model villas, over two floors, stand out. Each home has three bathrooms and four bedrooms. The master bedroom also offers the advantage of direct access to the terrace and a large window which enables you to enjoy the sea views with no need to step outside. The layout is designed to make the most of the hours of sunlight, and the home is ideal for those who love outdoor life, thanks to its private pool and large Mediterranean garden. It’s everything you’ve ever dreamed of, in one place! In our Lirios Sunrise development, our Albor model stands out. 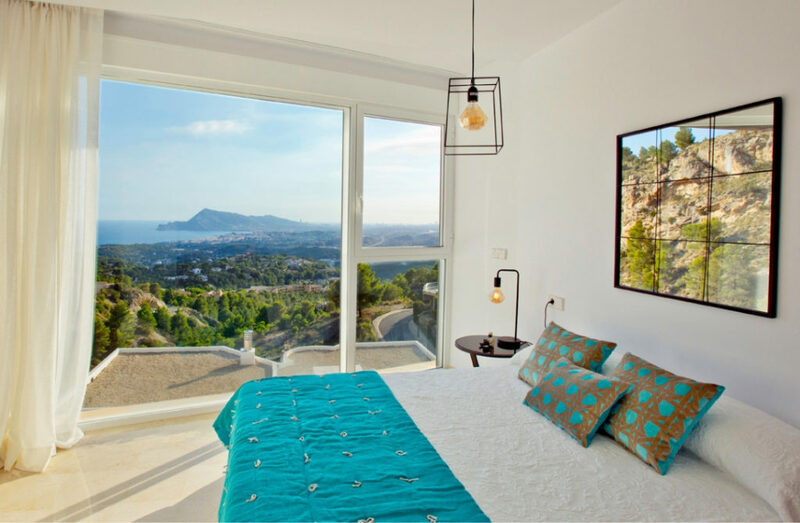 Designed to ensure you enjoy the incredible sea views, on clear days it offers views of the island of Ibiza. The property’s architecture fuses the interior and exterior to create a villa which works well as a whole. This model has three bedrooms, three bathrooms and a private infinity pool which merges with the blue hues of the sea. Live a unique experience, every day! 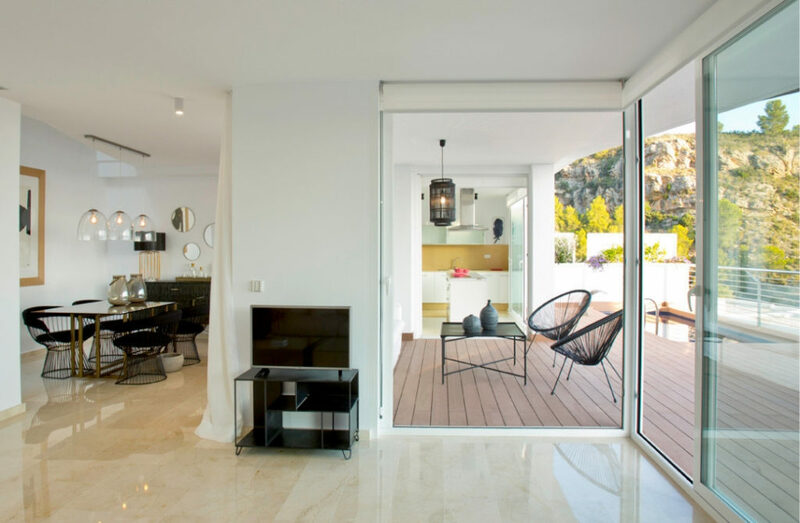 In addition to our luxury apartments and villas in Cumbre del Sol Residential Resort, we also have several developments in Altea, one of the most beautiful municipalities on the Costa Blanca. 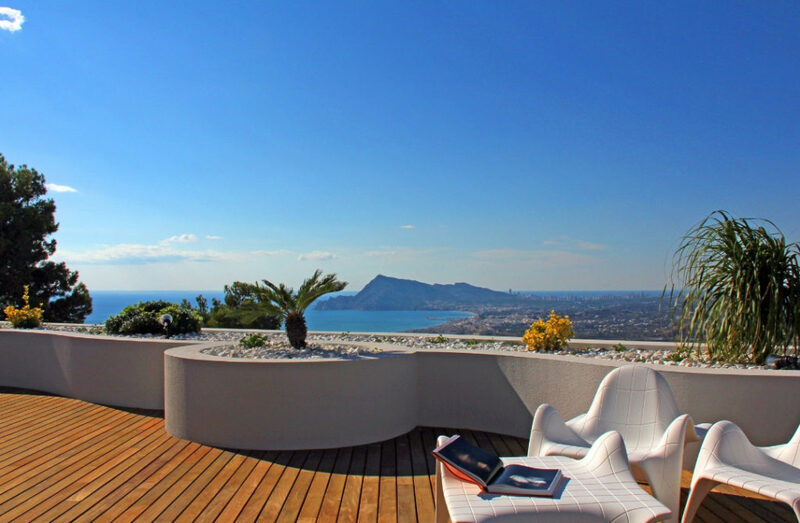 Discover our exclusive, private residential complex, Blanc Altea Homes, where each villa is unique. All the homes in this development boast cutting-edge designs and architecture, the very best finish, and extraordinary sea views. 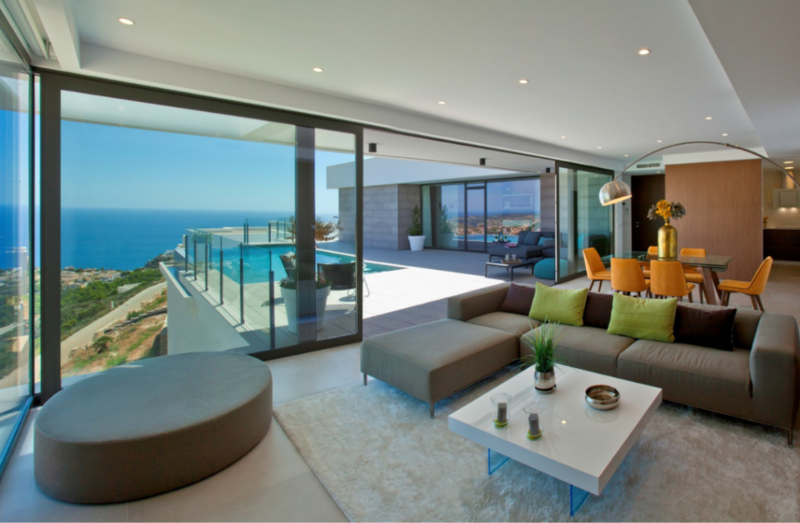 These villas stand out as a result of their spacious interiors, designed to make the most of the natural light. You can choose from a layout of three or four bedrooms and three or four bathrooms. In addition, these luxury villas have an open-plan kitchen, living rooms and dining rooms, a terrace, a private pool, a barbecue, a covered garage, and a lift. You won’t be able to resist their charms! 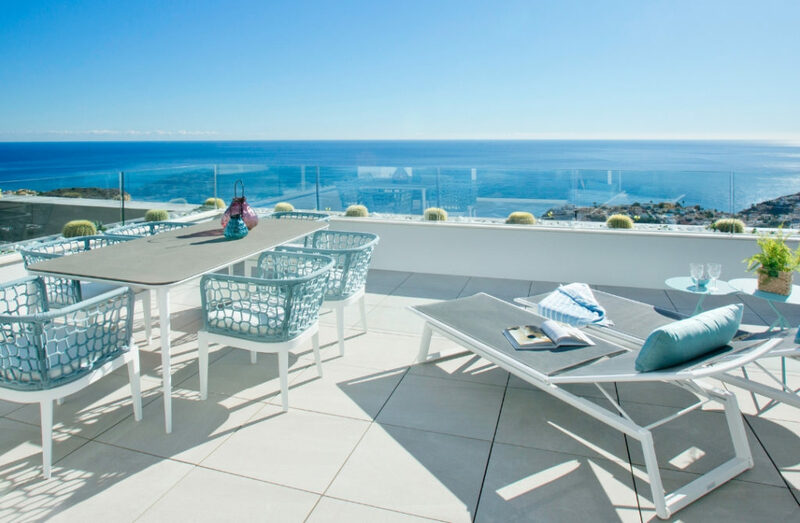 In Ocean Suites Altea, you will enjoy a development of luxury apartments which, thanks to their large size and incredible panoramic views of Altea Bay, have no reason to envy our villas. These apartments have an area from 575m2 to 900m2, with terraces from 120m2 to 300m2, 3 bathrooms, and 3 bedrooms with direct access to the large terrace. This could be your new home, so don’t wait any longer – get in touch with us! Whether you are looking for a luxury apartment or a luxury villa, find your ideal property with us. Don’t hesitate, fall in love with your new home on the Costa Blanca. Request more information by filling in our contact form and you’ll experience love at first sight…every day! The new year is here and with it come new starts and new resolutions for 2019. Are you dreaming of a luxury home by the sea? This is your moment! Looking out at the sea from your own balcony, enjoying the good weather all year long…wouldn’t it be wonderful? The Costa Blanca will offer you all this and much more. In 2019, make your dream come true! Our Blue Infinity apartments offer an excellent location in Costa Blanca North, in a private complex with security, impressive communal areas and spectacular views of the sea – a perfect place to live all year long. 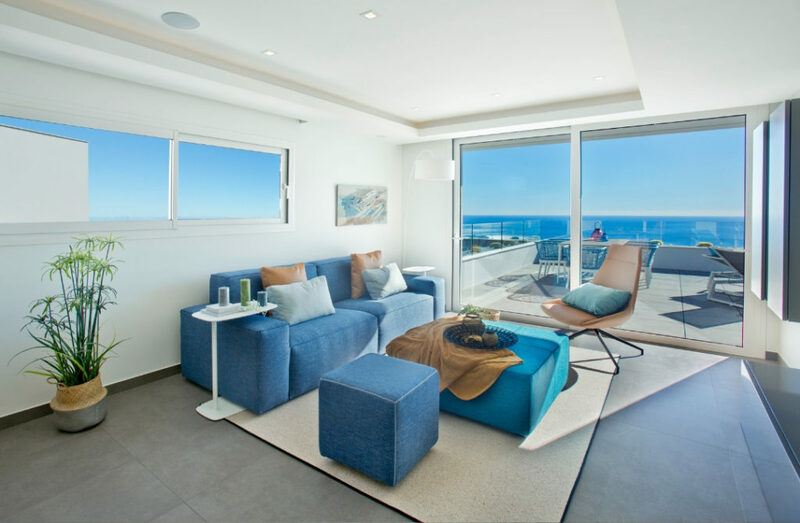 These luxury apartments are modern and elegant with a carefully designed interior and functional layout which aims to make the most of the sea views. 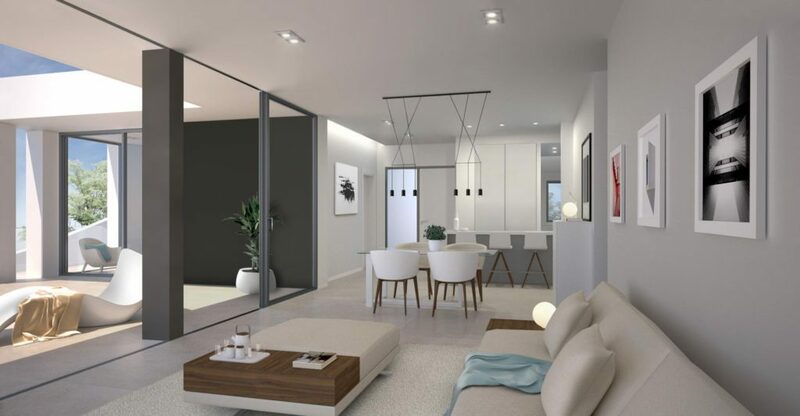 In this development, you can choose the apartment model which best fits your lifestyle: three bedrooms and two bathrooms or two bedrooms and two bathrooms. In addition, the development also has spacious communal areas with a large outdoor pool and terraces, and a wellness area with heated pool, jacuzzi, sauna, and Turkish bath, so here you will have everything you need to relax and enjoy this spot by the sea. If you would prefer to live in a villa, there’s the Lirios Sunrise development. 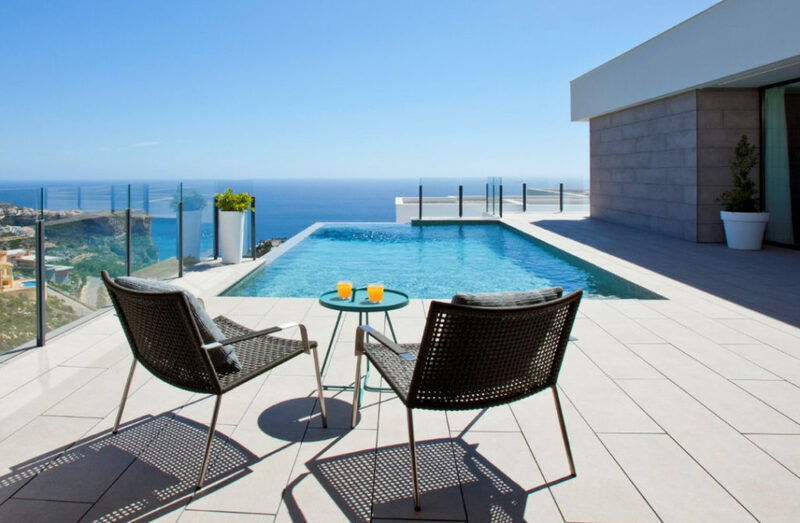 These stylish, luxury villas will welcome you with fantastic views of the Mediterranean and the island of Ibiza, and also offer spacious interiors with three bedrooms and three bathrooms. If you would like a home gym, a work space, or a guest suite, you can even transform the additional 68m2 open area on the ground floor into your own personalised space. In addition, each villa has private access and its own terrace. The façade, formed of large glass panels, allows the sunlight to make the living areas even more spacious and, thanks to this feature, you will be captivated each morning by the sunrise. In our Lirios Design development of villas, we have created several designs with different layout options so that you can customise your home by choosing the model which best fits your requirements, allowing it to become the home of your dreams. All of them have excellent views of the sea and a private pool, so you can enjoy an eternal summer from your infinity pool and organise barbecues with your family and friends on your spacious terrace. 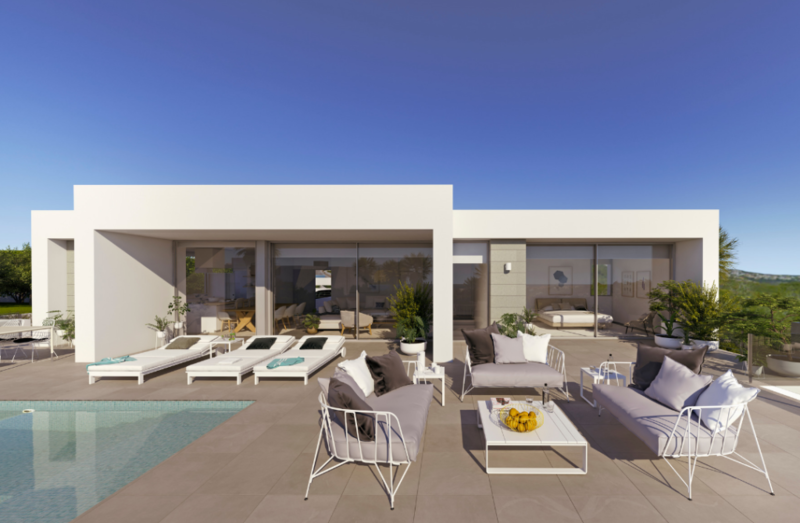 Further south, in the beautiful residential area of Altea, you will find our Blanc Altea Homes development. This private residential complex is surrounded by an unrivalled natural environment and offers stunning panoramic views of the sea and Benidorm’s skyline. These homes have unique architecture, an exclusive style, and a spacious interior which allows the sunlight to illuminate the whole living room. In addition, each one has a layout of three or four bedrooms and three or four bathrooms, an open kitchen, living room and dining room, terrace, and a private pool to cool off in on those warm days. There is also a barbecue, a private garage, and a lift. Make your dreams a reality in 2019… the Costa Blanca is waiting for you! For more information, fill in our contact form and start your new life.